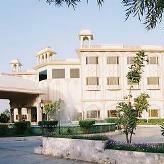 This 4 star hotel located amidst seven acres of aesthetically landscaped grounds, is just 21kms from the airport. Offering unique combination of ethnic traditional charm and ultra modern facilities, the hotel bears a total of 66 rooms. Rangmahal, the in-house restaurant offers exquisite delicacies, while Round the Clock coffee shop serves snacks and beverages. Other hotel facilities include a conference and a banquet hall, a gymnasium, a swimming pool and a lounge with a library.